Volume 15 | Bionic Power | Portable Power Takes Some Big Steps Forward! Portable Power Takes Some Big Steps Forward! Yad Garcha, CEO of Bionic Power, Inc. 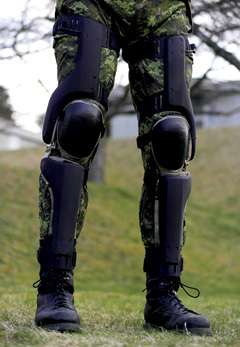 Soldier Mod talks with Yad Garcha, Founder and CEO of Bionic Power, Inc.
Mr. Garcha’s venture-capital background spans nearly two decades in the biotech, medical device, and pharmaceutical sectors. 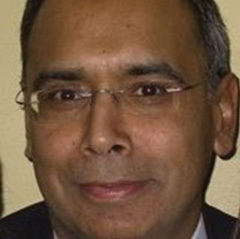 A former Senior Vice-President at GrowthWorks Capital, Mr. Garcha also worked at the Business Development Bank of Canada. Mr. Garcha led investments in Angiotech, Anormed (sold to Genzyme) and Creo Products (sold to Kodak). Mr. Garcha earned a Bachelor of Science in Microbiology from the University of British Columbia and an MBA from the University of Western Ontario. Bionic Power is developing a wearable kinetic energy harvester called the PowerwalkTM. Q: Nightvision, comm-tech, laser sights, GPS and more – the networked and indeed the “wired warrior” is becoming a reality, and that means a need for lightweight, reliable power. Before we discuss your solutions, tell me a little bit more about that evolution, and how “power hungry” the modern warfighter truly is? A: New technologies have been added to soldiers in an iterative process. Prior to the advent of communication devices, soldiers fought in a diagonal line in close proximity to each other. They did this to be within “shouting distance.” Once two way radios were deployed, relative distance between soldiers was no longer an issue. However, commanders still needed to know soldier location, so when GPS became available it was deployed. Since soldiers had GPS data, display systems were deployed to provide soldiers with the location of their fellow soldiers. Now that soldiers had display systems why not show battle plans, or live pictures or videos from drones? As each technology was invented it was added to the soldier. Now soldiers have two way radios for voice and data, GPS, and a display system. In addition, soldiers have target acquisition lasers, night vision goggles, flashlights and personal devices. All of these devices were not planned as a system. Rather, soldiers are treated like a Christmas tree, with various technology ornaments hung on them. Consequently they have myriads of battery types and many, many backup batteries so they don’t run out of power while on a mission. As a result of the technology deployment, for a 72 hour mission, a soldier may need to carry 26 pounds of batteries! Photo © Bionic Power Inc.
Q: And throughout that evolution, I’d imagine the key issue has been SWaP: size, weight and power. How has Bionic Power answered that call and surmounted that challenge? 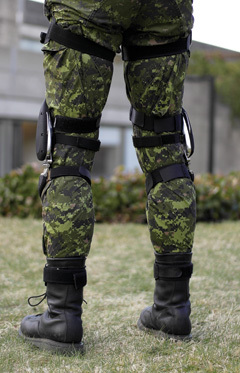 A: Yes, two of the key goals for the soldier is reducing weight carried on their backs and reducing complexity. The Army would like to reduce battery types and the battery count. 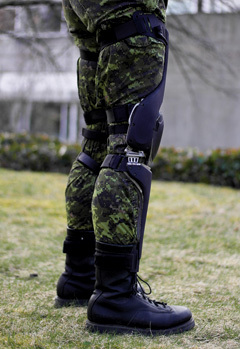 By using a large battery like a 1 KG Lithium ion battery or a conformable battery, the soldier can reduce the count and energy harvesters can keep the battery charged. If the harvesters can produce enough power, the soldier will likely need to carry fewer back-up batteries. Currently, batteries are a supply chain issue and limit mission duration and effectiveness. I can show you pictures of large bins full of discarded batteries from forward operating bases that are very revealing, obviously soldiers go through many batteries. Q: How and where are your PowerWalkTM solutions being used? A: None are currently in use at this time. We are still in development and at least 18 months away from having small volume manufacturing capability. We are being funded by the U.S. Army to develop and test the product. Q: What are the relative advantages and disadvantages of current “portable power” technologies? Why has Bionic Power chosen to focus on the particular solutions it has? A: A battery is a very good source of portable power, but there is a finite amount of energy stored in each battery. Consequently, soldiers carry extra batteries as a precaution. Harvesters have the advantage of providing an unlimited amount of power under the right conditions. For solar, an unobstructed view of the Sun is needed, and performance improves if solar panels are directly facing the Sun. Kinetic harvesters need movement, i.e. walking to generate power. The biggest challenge for our device is comfort and perceived value to the end user. So, we need to continue working on user acceptance by improving comfort and adding value that the user will truly appreciate. Q: Weight savings are one thing, and as discussed that is always an issue for dismounted soldiers, but I understand these solutions also present a significant cost savings over time. Can you explain? A: While weight saving can be substantial for longer missions, the cost saving is substantial for missions of any duration. Depending on distance, the ultimate cost of getting a fresh $0.30 battery to a soldier “in theatre” is between $3 and $30 due mainly to transportation logistics. DARPA has analyzed these logistical costs and estimated the total cost as $1.86 per Wh. For a typical duty day, the Bionic Energy Harvester would save $135 in batteries. If we assume 200 mission days per year, this works out to a total cost savings of $27,000. If we assume that the government purchases the units for $5,000 per user, then PowerWalkTM will pay for itself in only 35 days of use. Thus, the Bionic Energy Harvester would pay for itself after only 35 days of use. So there’s a strong cost benefit to use of PowerWalk™ in addition to mission duration and effectiveness benefits. The U.S. Army has a stated goal of 100% of dismounted soldier power being harvested in the field for these reasons. Q: How are you working with the militaries you supply in terms of providing your solutions? Are you working through/with any specific Project Managers or Programs? A: We’ve enjoyed close working relationships with both the US and Canadian militaries and PowerWalkTM has been developed with their input. We’re currently working with the US Marines Corps and US Army Program Executive Office (PEO) Soldier, Program Office (PO) Soldier Warrior managed by NSRDEC. Our intent is to sell this product into commercial markets as well. A much lower priced unit, targeting consumers and prosumers, is under development consideration. Q: Are you under any kind of “exclusivity” with the Armies of North America? What about other modernisation programmes of other armies? What action should they take? Should they be interested in Powerwalk™? A: There are no exclusives with any country, but we are better served to limit our interactions to “friendly” countries. Our likely customers are generally those militaries that deploy substantial technology at the soldier level. We expect potential customers to start with demonstrations, limited trials on their own soldiers, integration with their electronics, then placing an order for real world trials. Q: Have there been other countries that have approached you? What countries would you like to expand to? A: Many countries are monitoring our development with the Canadian and U.S. Armies. Representatives from the militaries of the United Kingdom and France have expressed interest in learning more about the technology, but I suspect they will get more seriously interested once we are closer to production, in about 18 months. Q: Are any of the major primary military contractors taking a similar approach to portable power as you are? A: There is no question that portable power is a problem for the dismounted soldier. Primes have been waiting on the sidelines to see what technologies get developed and which major customers are likely to commit to large orders. Primes’ business model is not to create demand but rather to step in and fulfill demand. Major customers would like to see the primes play a larger role to reduce risk of relying on a small company. We fully expect to engage a prime in a material relationship. A: Our core competence is harvesting kinetic power and developing technologies to optimize power production. We are good at understanding customer need and then iterating our development to get it right. We do not have manufacturing in-house at this stage. We will need to develop manufacturing capability, contract out manufacturing, or partner with a manufacturer, likely a prime. Q: Where would you like to see Bionic Power 5, 10 years from now? A: There are over 2.6 billion people in this world without access to reliable power. We want to have at least one harvester in every family that needs it. We want to make a difference in their lives by extending their day by a few extra hours by charging batteries to light up their home with LED lights. In the meantime, we envision selling our devices to most advanced militaries, professionals in the field, and even consumers in the developed world.